CSA Balloons now offers its clients giant balloons as a new, fun and exciting promotional tool to use at corporate events and promotions. What are Giant Logo Balloons? Custom logo balloons are promotional items and the basis of the services provided by CSA Balloons. Now, this company is offering a new and exciting product: giant custom balloons. Double the size, double the fun, as it is said. These balloons are 3-feet in diameter and can be used for all kinds of occasions. They are especially perfect for businesses wishing to promote their product. Since these balloons are larger than the average size, they grab people’s attention and bring new clients to your event or booth. Custom printed giant balloons are ideal for innumerable outside event like walking for causes, summer festivals, exhibitions, campaigns and fundraising events. 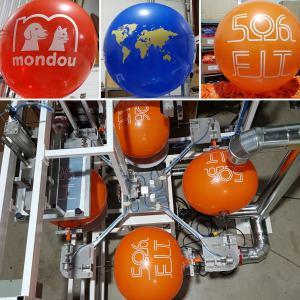 CSA Balloons has new technology to make printing 3-foot balloons as effective as possible. CSA Balloons can print 1 side, 2 sides with the same logo, 2 sides with different logos, 1 side with two colors, and 2 sides with 2 colors. The choice is yours. They can do it. Ordering 1 side with 2 colors and 2 sides with 2 colors have big competitive advantages as having more than one ink color available permits a good rendering of two color logos or images. The minimum amount of balloons to order is 10 balloons, with up to five balloon colors. Especially if you are considering having a giant balloon bouquet, having balloons in different colors make you stand out. The logo imprint can be as big as 20 inches x 20 inches, with fast production and turn around. Trust CSA Balloons for top quality 36-inch balloons in your choice of 40 balloon colors. 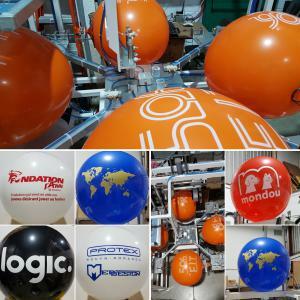 A custom printer is a professional at printing and creating custom logo balloons. CSA Balloons is highly-qualified and well-known in the balloon printing business, having worked in this industry for 15 years. Hiring a custom printer has many benefits for businesses. Custom printers are confident in what they are doing as they have experience in the custom printing domain.